Q) When do you arrive to start setting up? A) For weddings, funerals, and larger events, we arrive an hour before serving time. For smaller parties and business meetings, we arrive about 30 minutes before serving time. Q) Do you need a deposit? A) No, full payment is due the day/night of the event. Q) How do I get pricing for my event? A) Fill out the information on the Request A Quote tab and we will contact you with a quote. You can also feel free to call or email us for pricing. Q) What kind of menu do you offer? 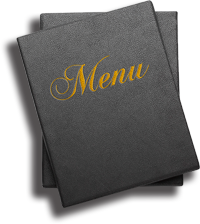 A) You can view our menus on our website by clicking on either the Wedding, Funeral, or Special Event under the Menus tab, depending on what type of event you are holding. You can also find the menus on our Facebook page. Q) What do I need to give you to book my day? A) When calling us to book your event, please have the following information ready: name, phone number, date of event, location of event, and estimated number of attendees. Q) When do all of the details need to be finalized? A) For weddings, we ask that the menu be finalized 2-3 months before your event and the final guest count finalized 2-3 weeks in advance. For smaller parties, the time frame varies with the event and when you book it. Q) Do we get to keep the leftovers? A) Depending on its availability after everyone is served, you are able to take home leftovers of hot food only, so please bring containers (Ziploc, Tupperware, Gladware, etc.) to your event. Q) What kind of work space do you need? A) We would ideally like a small kitchen with a prep table, but if the event is outdoors, just a prep table would be great. For the serving line, 2-3 six-foot tables should suffice, depending on your food menu. Check out our wedding menu, funeral menu, and special event menu. You can request a quote online or contact us today.